Time for God: He opened his eyes. Do you ever feel like you are not worthy enough -- or qualified -- to do something? I feel like that sometimes when it comes to spreading God's word and sharing in my writing. I mean, think about it -- its GOD's word. You cannot really get any BIGGER or more important than that! Every now and then I wonder - who am I to think that I can take on such a task? After all, I do not claim to be a scholar when it comes to the Bible. Heck, my family didn't even really go to church while I was growing up! So how can my amateur musings have any impact on anyone? Now, let me tell you what I discovered the other day. Have you met Paul (aka Saul)? Paul holds a huge place in the Bible, turning many people to Christ, both in Biblical times and still today through his writings in the New Testament. But before he began down that path, Paul fought against Christians! Acts 9:1 (NIV) says he "...was still breathing out murderous threats against the Lord's disciples." Jesus spoke to Paul and questioned his actions. It was at that time he made him blind -- for 3 days! Then the Lord sent Ananias to Paul and had him place his hands over his eyes. He told Paul..."the Lord - Jesus, who appeared to you on the road as you were coming here - has sent me so that you may see again and be filled with the Holy Spirit." Acts 9:17. He opened his eyes. He once was blind and now he can see. He once persecuted Jesus and his followers and now he has become one! The true work of the Holy Spirit! 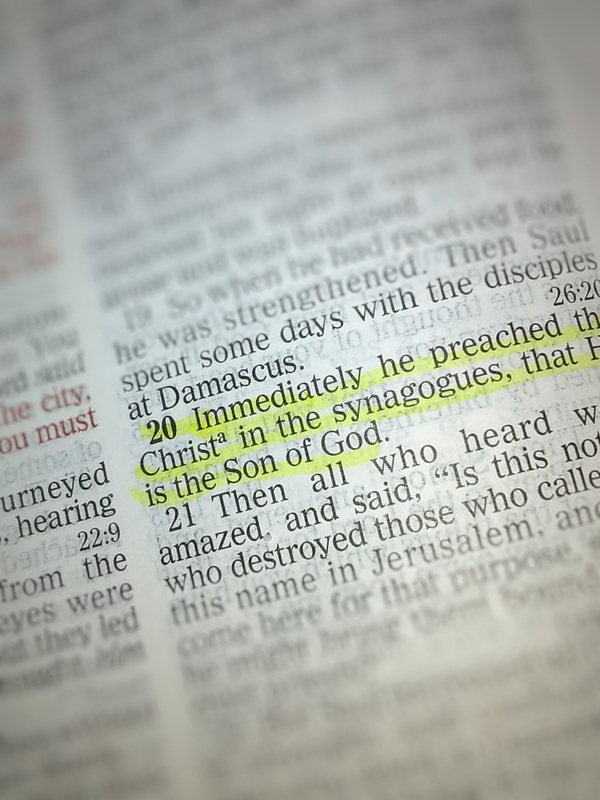 Here is what got me: Paul was a new Christian, but he immediately began to preach. All he started with was by sharing that "...Jesus is the Son of God." Acts 9:20 (NIV). Those 6 words are powerful. He didn't have to know the intricacies. He just needed to know - and BELIEVE - that Jesus is the Son of God. 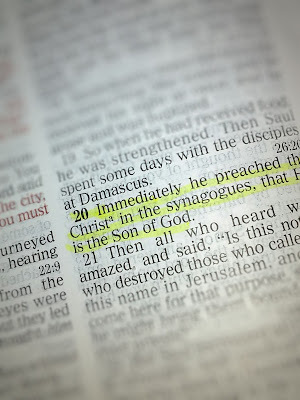 Once he began sharing, God built the fire up in him as he "...grew more and more powerful and baffled the Jews living in Damascus by proving that Jesus is the Messiah." Acts 9:22 (NIV). Paul went on to impact people in many different areas by letting God lead him. Let me leave you with this -- Paul proves that it doesn't matter who you are, where you came from, what you have or haven't done in life. If you believe that Jesus is the Son of God, then you know that you are called according to God's purpose. Remember, "For we are God's handiwork, created in Christ Jesus to do good works, which God prepared in advance for us to do." Ephesians 2:10 (NIV) He will give you everything you need to pursue your gift, even when you feel incapable, unqualified or unworthy. Start with what you know and HAVE FAITH. He will carry you through.